If you have run out of fuel and need to refuel your vehicle from a portable fuel container, use the funnel provided with your vehicle. 2. Press the fuel fill door release button. 3. Take the funnel out of the tool case in the trunk. 4. 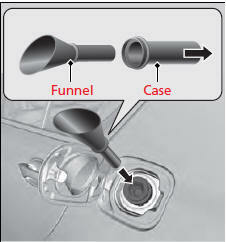 Remove the funnel from the case. 5. Place the end of the funnel on the lower part of filler opening, then insert it slowly and fully. - Make sure that the end of the funnel goes down along with the filler pipe. 6. Fill the tank with fuel from the portable fuel container. - Pour fuel carefully so you do not spill any. 7. 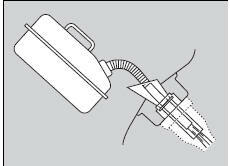 Remove the funnel from the filler neck. - Wipe up any fuel from the funnel before storing it. 8. Shut the fuel fill door by hand. Do not insert the nozzle of a portable fuel container or any funnel other than the one provided with your vehicle. Doing so can damage the fuel system. Do not try to pry open or push open the sealed fuel tank with foreign objects. This can damage the fuel system and its seal. Make sure the fuel in the portable fuel container is gasoline before you refuel.